Energy Efficiency Stories 2017 just closed its doors with a great success of attendance and active participation. Held at Acquaworld, Concorezzo (Italy), the one-day conference is organized by TIMGlobal Events and Energy Efficiency B&I with the support of ENEA, ANIE Energia, ANIE Automazione, Assoege and Energy & Strategy Group of Politecnico di Milano. At the end of the conference, participants had the possibility to attend an organized tour at Gruppo Sapio’s Plant, in Caponago. Marco Marangoni, Associate Publisher at TIMGlobal Media, Cristian Son, Group Publisher, and Sara Ibrahim, Editor of Energy Efficiency B&I and Moderator of the conference, opened the event with their keynotes. After that, speakers presented their successful application stories of industrial energy efficiency. The appeal of the locations and the high quality of the presentations have attracted more than 100 selected participants, among which there were Energy Managers and Plant Managers of the most representative Italian companies, such as Pirelli, ENI, Enel, Trenitalia. AB, CGT, Festo, Gruppo Salteco, Hydac, Intergen were Main Sponsors. ESA Automation, Giakova, Ital Control Meters, Mennekes, Mori Raddrizzatori, Nuova CMME, Repcom, SDT gave their support as Sponsors. Energy Efficiency Stories 2017 gave participants the opportunity to share even more experiences and ideas through “Talking about Metering”, a speed workshop about Industrial Monitoring organized and developed by NUEN Srl with Visual Stories with the partnership of TIMGlobal Events. 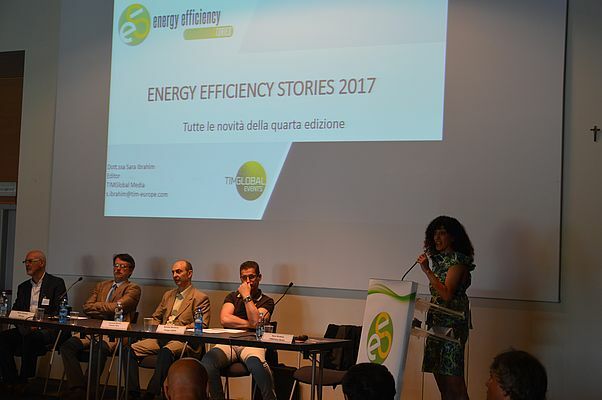 The 5th edition of Energy Efficiency Stories will be held in 2018.